Born in Edinburgh, the sculptor and graphic artist Eduardo Paolozzi (1924‒2005) was one of the most innovative and irreverent artists of the British postwar period. He co-founded the influential London Independent Group, a union of British artists from different disciplines formed during the war that broke with the conventions of aesthetic and academic practice. In 1974 and 1975, Paolozzi spent a productive year in West Berlin on the invitation of the German Academic Exchange Service (DAAD). 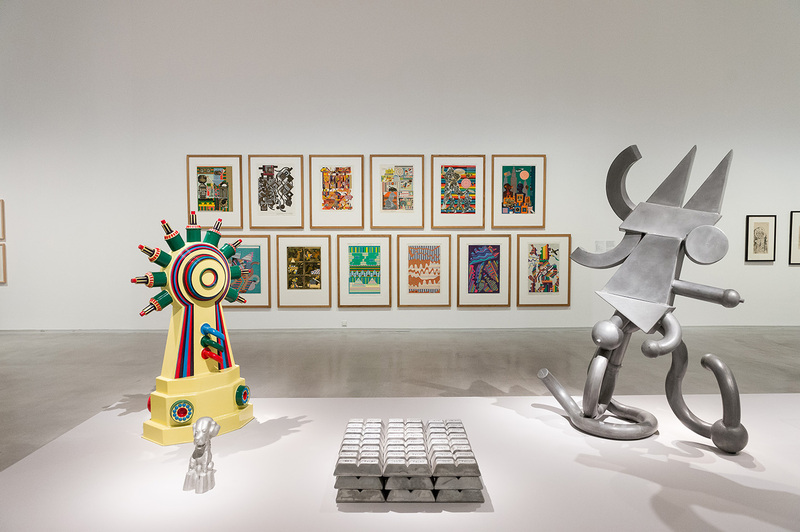 This exhibition is based on Whitechapel Gallery‘s 2017 Eduardo Paolozzi retrospective in London which showed the complete works of the artist. 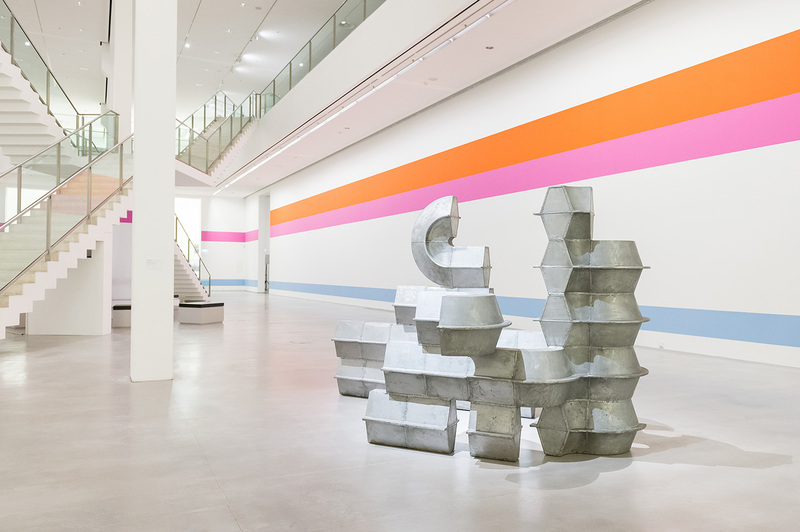 In contrast to the London show, the Berlinische Galerie focuses on his idiosyncratic and experimental work of the 1940s to the 1970s with which the artist attracted much international acclaim. The exhibition brings together his most significant works from private and public collections worldwide, joined by numerous works from the collection of the Berlinische Galerie. Paolozzi was one of the first to embrace consumer culture and mass production in the UK. In his glued pictorial worlds, modern cards, aliens, pin up girls and figures from comic books collide upon one another – a diverse mix rendered in brash colours that was soon to make art history as Pop Art. In the following years, Paolozzi used the collage technique as an artistic strategy, innovatively applying it to the mediums of sculpture and print. His expressive works explore the intersections between man and machine. The product of the artist’s particular interest in science and technology, they are part of his search for a new visual language and iconography for mass culture and industrialised society. The first chapter of the exhibition focuses on Paolozzi’s early work. His drawings and sculptures from the early 1950s are influenced by Surrealism. 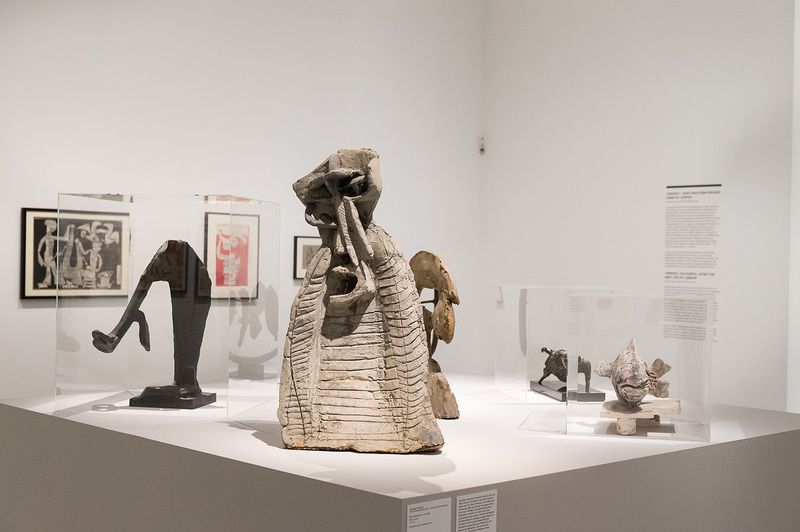 Paolozzi was inspired by the art of Pablo Picasso and Alberto Giacometti. He also took an early interest in popular culture and mined American magazines and comics for his early pop collages. 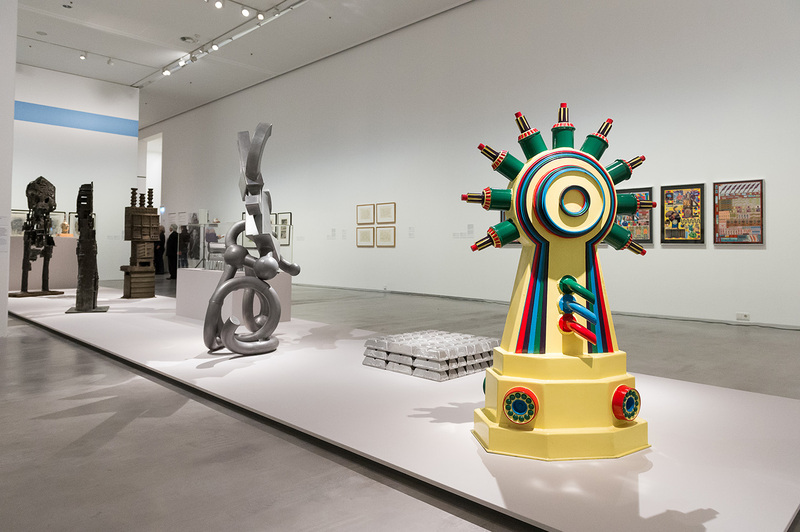 Paolozzi’s intention to break with tradition and use new materials and industrial processes in his sculptures and print work is the theme of the second chapter. This radicalisation of sculpture started in the 1950s with his development of brutalist bronze pieces that recalled the wounds of war. Their charred and eroded looking surfaces gave them their aesthetic impact and accusatory tone. 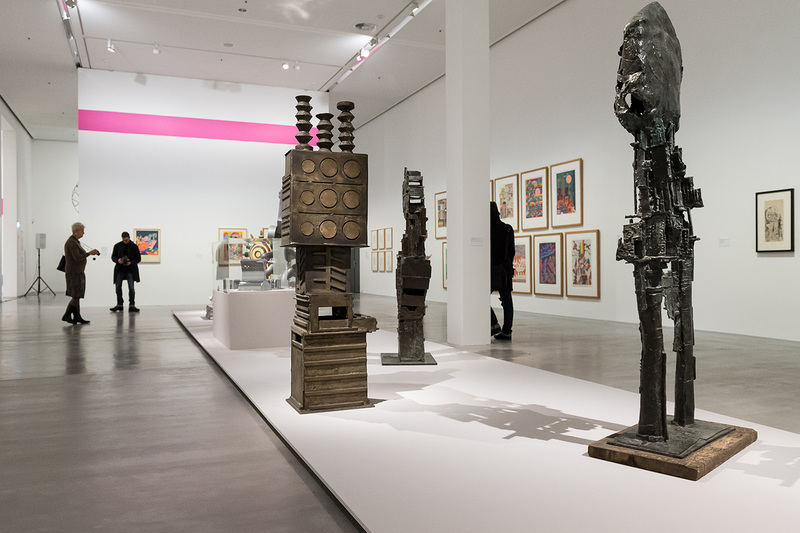 Later Paolozzi created metal sculptures made from industrially produced elements, some of which he painted. He also broke new ground in print and was one of the first to use silkscreen printing in art. Its commercial use and the number of copies it allowed made silkscreen printing the medium of the masses. This appealed to Paolozzi, whose aim was to eradicate the boundaries between high culture and popular art. 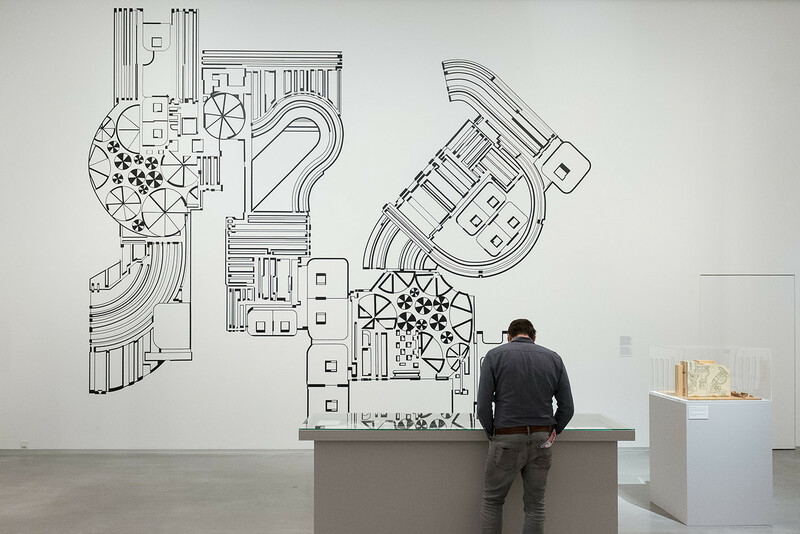 The third chapter of the exhibition centres around Paolozzi’s productive stay in Berlin in 1974/75. In his studio in Kreuzberg around Kottbusser Damm, the artist developed new series of graphic works inspired by music like The Ravel Suite and Calcium Light Night. Here, graphic and linear elements merged to form abstracts compositions reminiscent of cityscapes from a bird’s eye perspective, topographic maps and circuit boards. In his reliefs from this time he translated the formal language of silkscreen printing into three dimensional space. The artist also left traces in the cityscape and its large public collections. For instance, he painted a monumental black and white mural in Kurfürstenstraße which has not been preserved. The final chapter of the exhibition is dedicated to Paolozzi’s pioneering spirit. His irreverent approach to art continues to inspire young artists and graphic designers. His broad definition of collage, early forms of sampling, print and presentation techniques, innovative film piece and passion for mass media and for the technology of his time paved the way for a new kind of understanding of art that shapes us to this day.